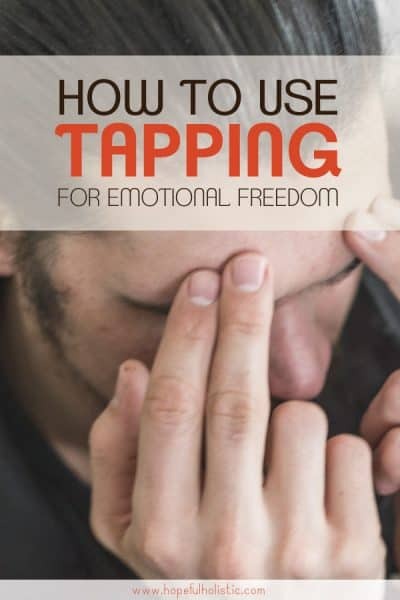 Tapping, also called EFT, or Emotional Freedom Technique, is a way to reduce the pain caused by negative emotions and brain signals. Tapping is a powerful healing therapy. It’s a tool that everyone should know about before trying pills or drugs that do nothing but suppress symptoms! Read on to find out about the meaning of tapping, how it works, and how you can start tapping for immediate benefits. This website contains affiliate links- meaning that if you follow a link to something I recommend, I might receive a small commission at no extra cost to you. More info here. Simply put, tapping means using your fingertips to tap on different parts of your body to move energy. But don’t start just tapping every inch of your body just yet- tapping actually works using your energy meridians. This is the same type of science used in acupuncture. It’s an ancient technique that we’re learning more and more about as science advances. Tapping is a self-applied tool to help you feel better. It’s easy enough for kids to do! It can be used for a variety of maladies (more on that below) but no matter what you’re using it for, EFT, emotional freedom technique, works by clearing the negative emotions that you’re experiencing around pain, trauma, anxiety, and more, and replacing it with positivity so that you can better move towards wellness. Overall, tapping means giving your feelings a name and listening to your body. Just because tapping works using the flow of your emotional energy doesn’t mean that it’s only useful for emotional issues. Tapping might be a good idea when you’re in physical pain, feeling other’s energy, sad, about to do something scary, feeling anxious, stressed, triggered, vulnerable, angry, and more. EFT is kind of counter-cultural. We live in a world that emphasizes positive thinking, and it downplays or even shames us for any other emotions. We aren’t given much of a chance to grieve or really feel feelings. The problem with this? “Think positive” doesn’t work! Tapping starts with and focuses on more than just positive thoughts because we need to process through the negative, hard feelings we’re feeling, in order to get them unstuck and move on to something better. EFT gives you a safe place to grieve and feel emotions. When you tap on your negative feelings are they are moved and drained, it can also remove the things that are lowering our immune system and making us prone to disease. Then there will then be room for better feelings and positivity. Tapping gives you permission to feel, to release, and to look forward to the brightness of your existence instead of hanging on to what was holding you back. You only need to try it for yourself to see if it works, but what’s really going on behind tapping? There are many things that we know do work, before we know how they work. For example, the medical community knew that antibiotics worked years and years before the figured out how they work in the body. It often takes decades to tap into (pun intended) all the mechanisms. However, science is starting to catch up with the wonders of tapping! 100+ peer reviews on EFT effects on the brain show tapping as being effective for PTSD, depression, anxiety, and more. We’re just starting to learn more about what’s happening in the brain, nervous system, and our hormones. We’ve discovered that tapping works in part thanks to neuroplasticity– the idea that our brains are malleable and can change very quickly. The very structure of your brain can be rewired as you think, feel, and act. Tapping changes your brainwaves. It can help your brain’s theta waves (which cause fear and anxiety) calm down and restores a sense of peace. 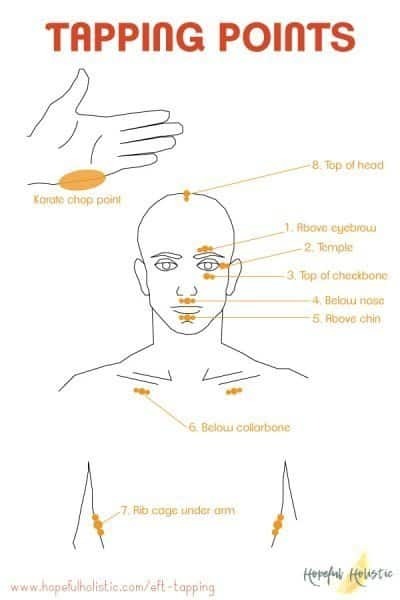 EFT helps to bring your brain back into equilibrium. Unfortunately, there’s a dark side to neuroplasticity too. According to Dr. Dawson Church, a leading expert in EFT, neuroplasticity helps us to learn and grow, but it can also strengthen and make a habit out of shame, anger, and other negative emotions over time. So if you’re in your 30s, 40s, or older, you may have some very strongly developed neural habits. In a way, you might be hardwired to be anxious! And it could get worse over time. Thankfully, EFT can help to break those strongly conditioned emotional memories. It can help you change and form new neural habits. No matter the trauma or pain you’ve been through, or the shame and anxiety you feel, there is healing and growth available! Both stress and relaxation can affect our epigenetics, or the way our genes express themselves. Epigenetics is gene expression caused by an outside force. You aren’t born with it. Think about how stressed we usually are in the US. Stress is toxic, and pretty much every single ailment you could experience has an emotional component, so learning about how to balance your stress and relaxation (without drugs) is an important skill to work on. Self-care and stress reduction are huge for your health! While stress can actually make you sick through changing your genetic expression over time, tapping does the opposite. EFT alters the balance of gene expression. Tapping and releasing the stress you’re holding turns off the genes that signal the need for cortisol and other things related to adrenaline and anxiety. It replaces these negative signals by turning on the genes for things like immunity, anti-aging, relaxation, and more! This is great news for someone who thinks they have “bad” genes! You aren’t doomed. I think that one of the most amazing things that tapping can do is to reduce pain, and I’d like to explain how it does this. Sometimes, pain is good. If you took so many pain-reducing drugs that you couldn’t feel any pain at all, you might burn your hand (or worse) without realizing it. Pain isn’t here to be medicated away. It’s a way for our bodies to get our attention. Tapping works, not by blocking the signals your body is trying to use to get your attention, but by taking care of the emotional side of pain. The crazy part is that those emotions can make up a ginormous 2/3rds of the pain you’re experiencing! If you’ve ever had any kind of chronic pain, you probably understand this. When the pain starts, you might think “oh no”, or “maybe it will get worse” or “how do I get rid of this? ?” All these negative emotions worsen the pain. With EFT, 2/3rds of the pain can go away, making the physical sensations manageable. Tapping can allow you to get past the fearful, angry reactions you might have towards your pain so that you can listen to your body better. Once you start using tapping to tune into your body, it won’t have to use huge dramatic symptoms to get your attention. You can learn to listen when your body says to slow down, or when it’s asking you to take care of it. 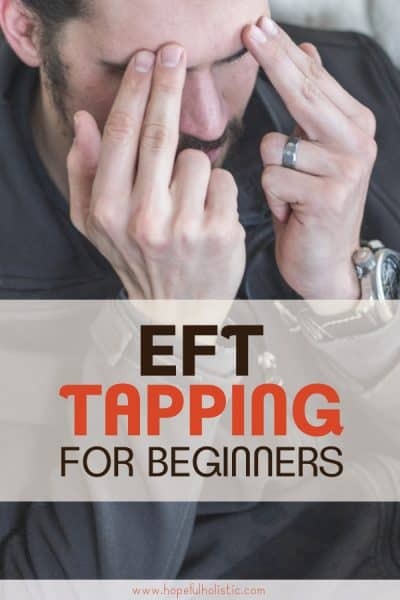 So if you’re new to EFT, what issue should you start tapping for? You should start with something that’s a small scale, that’s not too intense. If you’re just starting to learn how to do tapping, start with something immediate like a headache, back pain, anger, or anxiety. Your first few times you try tapping, don’t go after things like extreme pain or childhood trauma. Leave those for when you’re a little bit more experienced with EFT, or when you’re working with sometimes trained in tapping. The tapping method is very easy to learn and can be used for a wide range of issues. Just follow these steps to tap through your emotions and start feeling better with EFT! There are also a few tapping videos below that you can follow for guided tapping meditations. If you’re new to tapping, scroll up and read about deciding what to tap for. It’s best if you choose something that you’re dealing with right now, whether that’s an emotion or a physical feeling. Choose something specific, that you can visualize easily. If you want to, you can give your feelings or pain a number. This will help you track how tapping has helped, and it will help you decide if you need to do more than one tapping session. To set up your EFT session, you’ll start by tapping on the side of your hand three times. Either hand is fine. Tap fairly firmly on the karate chop point. Name the feeling, accept it, and affirm your self-love. Now that you’ve done that, you’re ready to move through the tapping points and start moving these emotions! Next, you’ll tap through each of the tapping points. There are different points you can try, but this is a good place to start. You’ve actually probably already discovered a lot of these points subconsciously. Whenever we feel distraught, upset, or anxious, we tend to gravitate towards these points automatically! You might have been tapping without knowing it! With EFT tapping, we’ll use eight points of tapping to start moving towards the results you want. In this diagram, I’ve put two or three dots to show how many fingers I use for each point, and I put dots on both sides of the figure for points where I tap each side of myself at the same time. So, for example, I only use two fingers on one temple while tapping, but I use three fingers below both collarbones. You don’t have to do it this way, but that’s how I do it! Use two or three fingers to tap lightly but firmly on each point. Some areas might be more sensitive than others, so be gentle. You don’t want to bruise yourself! Tap kind of like you’re lightly knocking on yourself with your fingertips- enough to get your body’s attention without knocking the door down. You can use your whole hand to tap below your collarbone and under your arm, if you want. Each time you tap on each of these points, you’ll say a short statement to yourself. These statements can vary widely depending on what you’re going through, so it might be helpful for you to look up a tapping guide or a video to give you some ideas. It also leads you through an intro tapping session with general statements that will help with physical pain or emotional issues. You don’t have to say anything perfectly, and it’s fine to repeat statements multiple times. It’s also just fine if you forget or skip a tapping point. You’ll want to go through all the tapping points at least four or five times, moving from describing all the negative emotions you might be holding, into positive statements about where you’d like your energy and emotions to go. After each tapping session, just sit in your new feelings for a little while. Take some deep breaths. How do you feel? If you gave a number to the intensity of your feelings, has that number changed? Feel free to go through the tapping session again. It might take half an hour to get the number down to where you want it, or at least somewhere manageable. Still, that’s not bad at all considering all the time you might have spent building up the negativity! Also, make sure you stay hydrated. We’re electrical beings, and we need water to make sure the energy can move as needed. Whenever you do any kind of emotional work, drinking lots of water can help you experience the full benefits of the work you’ve done, whereas being dehydrated can keep you stuck in the same old emotions. I think it’s way easier to do tapping if you don’t have to think up the statements for yourself. So here are some EFT videos you can use to help you through the process! This video can help you with feeling better from any kind of pain– from a headache to knee or back pain. Try giving your pain a number and give this tapping session a try! This one is for any time you’re feeling like you aren’t enough. One of my favorite things to use EFT tapping is for anxiety and fear. EFT works great for anxiety, and I use tapping any time I’m feeling anxious- which usually comes from hearing my internal dialog tell me I can’t do it, or that I’m not valuable, accepted, or worthy of love. Those voices can be loud, but tapping can help to replace that negative self-talk with something healthier! This one is for building body confidence and even losing weight! Many people have found success in using EFT tapping for weight loss. It might take numerous sessions, but it’s worth a try! As long as you’re trying to live healthfully and exercise, along with other healthy habits, tapping can help take care of the mental blocks you might have towards losing weight. This EFT meditation is for releasing any fear of public speaking you might have. Since this video is only a little over 15 minutes long, it would be easy to do right before you’re about to do a speech. Go through it once or twice before doing public speaking and enjoy how much better you feel while you’re on stage! And if you’re looking for EFT tapping therapy for kids, this is a great video to start with! This video makes tapping very kid-friendly. It helps children learn to look inwardly and understand how they’re feeling. Whether you’re a parent, teacher, or caregiver, you can try using tapping to help kids with their anxiety or, with this video, just as a way to help them start their day off right. There’s also a link to this video in Spanish in the description! There are many more tapping points than the eight shown on the diagram above. For example, the tapping meditation on my post on natural remedies for anxiety shows some tapping points on the sides of your fingers. Feel free to try other methods of tapping! If you want to go even deeper into this subject, I’d highly suggest reading the number one book on tapping- The Tapping Solution: A Revolutionary System for Stress-Free Living! I’d also encourage you to learn about your human design. Human design is a synthesis of eastern and western astrology, the Judaic Kabbalah, the Hindu Chakra system, the Chinese I’Ching, and quantum physics. It’s a way for you to learn about your unique energy blueprint, and start understanding more about your design, how you process energy, and the things you should be tapping for! Human design will help you dig deeper into how your energy moves, guiding you towards living more authentically, in a way that’s aligned with the truth of who you are. Have any questions about tapping? Have you tried it? And don’t forget to pin this post for later!